After Mick spoke his mind to a bossy buyer at work one day, Monsieur Nonin had to let him go, and Danny decided to leave as well. Monsieur Nonin liked Danny, and was sorry to see him go. Leaving Galleries Lafayette turned out to be a blessing in disguise because they got other jobs making more money. Danny got a job at Hamilton Motors, a garage that specialized in servicing U.S. made cars. Mick got a job in a plastics factory. During this time, by being very frugal, they saved enough money to buy a 1941 ex-army jeep for 300 pounds. 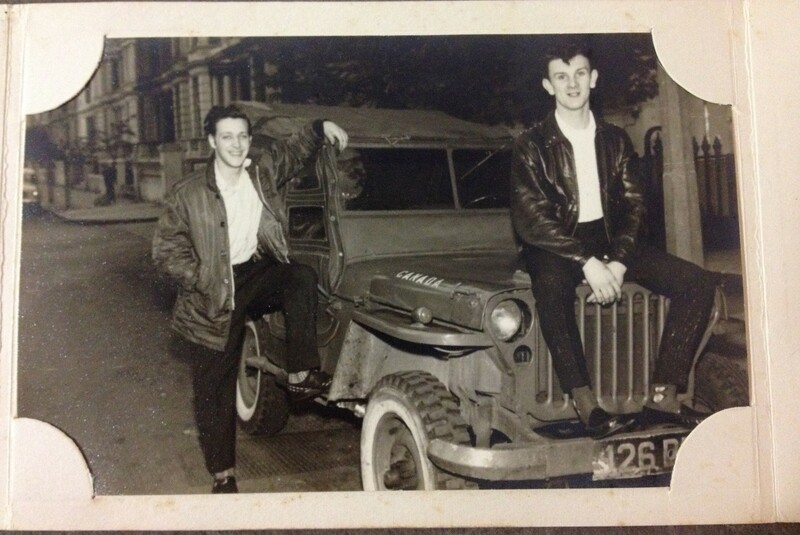 Occasionally on the weekend they would make the 250 mile trip to visit Mick’s parents who owned a local pub called The Station House.Someone told the local TV station in New Castle that the boys were intending to drive their jeep to India and that resulted in a ten minute interview on a public interest show. Their claim to fame! The job at Hamilton Motors didn’t last long and a better job came up at the Blue Star Garage in Sloan Square. This garage was a full service gas station and also a parking garage. Danny teamed up with a man from South Africa who had figured out a great way to make extra money. In addition to just parking the cars for customers who were shopping or working in Central London, they offered several other services. The fee charged for the labour was not deposited in the till, only what had a real cost to it. A deal was made to make sure Dan didn’t tell anyone about their inside operation. The extra money would be split 60/40 in favour of the South African since he had been doing this while working at the garage already for several months. There were the regular customers who wanted wax and polish jobs on their cars or oil changes, and some to just fill the tank with petrol. All were accommodated. The wash and wax money went straight into their pockets and the jobs that required the use of oil or petrol of course had to be accounted for, but a profit was made on all the services provided. The net effect was that instead of the regular salary of ten pounds per week, they were taking home thirty plus pounds! Pouring on the charm they got tips as well. The jeep took up residence at the garage and was given a thorough going over and many spare parts and service items were acquired at very competitive prices. After a year in England and 150 pounds in their pocket, the young men began their journey in July of 1960. With all their gear packed into the jeep they began an exciting round the world adventure. Their first stop before crossing the channel was to see Cecil Fox, staying a couple of days with their English friend before they left.